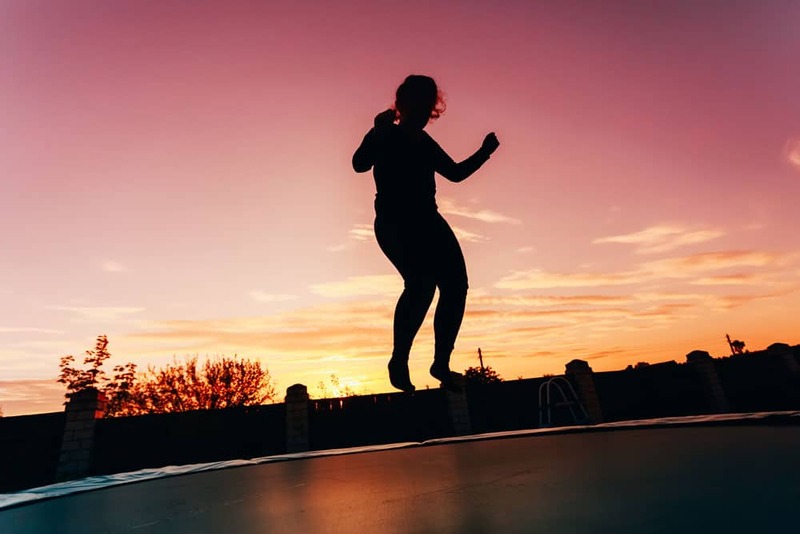 >> Trampoline Sizes: Which One Should You Get and Why? Trampolines are available in many sizes, and you can purchase the ones that you think are perfect for you. There are mini trampolines, medium-sized trampolines or large trampolines, which have varying weights as well as sizes. Ensure that you purchase the ones that are apt for your kids and you. If you purchase the trampoline for yourself only, you can make a choice without any hassle. However, if you decide to purchase it for your entire family, you have to consider a number of things. It is imperative that you have a correct idea of the sizes of trampolines and understand the one that will satisfy your needs perfectly. Trampolines under 10 feet are ideal for people who have a small backyard area. These trampolines cannot support the weight of more than one person. If you can enforce the discipline that no more than one adult or a kid will bounce on your trampoline, only then you should purchase this one. These trampolines normally cost around two-hundred dollars. Also, if you are looking forward to a small trampoline, this is ideal for you. Your first consideration should always be your backyard’s or garden’s size. Though it is bigger than the trampolines that are ten feet in size, these are a lot smaller than the big trampolines. Most people refer these trampolines to the medium-sized ones. If adults are jumping on the trampoline, this trampoline has a limit of one person only. But with kids, you can allow two of them to bounce, but ensure that not more than two kids jump at a time. Else wise, it can lead to fatal accidents and injuries. The twelve-foot trampolines are priced at around 300 dollars. 14-foot trampolines are big trampolines, which give you enough flexibility when bouncing. However, these trampolines are costlier, but again, they are worth the price. If you have a big backyard, this trampoline is ideal. Though most people do not tell this, the bigger trampolines are safer in comparison to the small trampolines, but you have to follow the safety rules. It is safer because the surface area is greater. With these trampolines, there are fewer possibilities of landing on frames or springs. These trampolines are great for individuals of all ages. Large trampolines cost around 400 dollars. These rectangular trampolines are portable, and you can place them at any desirable location. They do not need a huge space, and you can move them easily from one side of your backyard to the other. You should consider these rectangular trampolines if you have a low budget and you do not have enough area to keep the large trampolines. It is believed that the trampolines of this size have the best bounce. If you are looking for a bouncier trampoline, you should not look beyond this one. You can purchase one of these if you are involved in cheer leading or gymnastics. These trampolines can bear the weight of one adult and two kids. These trampolines are the larger versions for the trampolines which will help you to receive proper training if you exercise regularly or you are a gymnast. They provide an excellent bounce and help the professionals to sharpen their jumping skills. These trampolines can bear the weight of two adults and four kids. The 10*17 rectangular trampolines are the Olympic trampolines. They are recommended for individuals who are above the age of nine years. If your kids are below the age of nine, there are chances that they will not get their desired bounce. These trampolines are priced at about 600 dollars, though it is largely dependent on the brand that you select. These are the shapes and sizes of the trampolines that are currently ruling the market. If you are looking forward to purchasing the trampoline for your kids only, you can opt for the smaller circular or rectangular ones. You can also ask your kids about the shape preference that they have. In case your kid is not six years yet, you should purchase the mini in-ground trampolines for them. These in-ground trampolines can be placed both inside or outside your house. To conclude, when you are choosing a trampoline size, you have to consider numerous factors. The first thing is you have to know the size of your backyard before making a purchase. Buying a large trampoline will become pointless if it does not fit. Assessing the number of jumpers is also very important. Also, if you want your trampoline to last longer than usual, opt for the large circular trampolines. Lastly, owning no trampolines is better than owning an inappropriate trampoline.